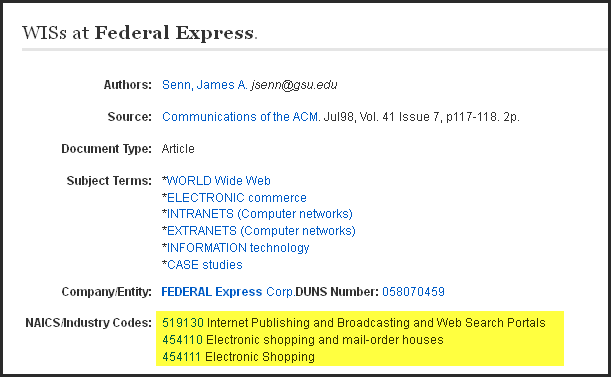 Many business databases tag their indexed articles with NAICS classification codes. You'll see them if you click on an article's title in the results list and open the abstract and the descriptive matter--not the fulltext, just the abstract/citation. Generally the codes will be hot-linked like they are in Business Source Premier. The use of the codes this way gives you two methods of searching: (1) you can use a code as a search term, and (2) you can use the linked code in a likely article to jump to related articles, a shortcut that is built into the structure of the database.